As part of the Bertarelli Foundation’s marine science programme, we have funded a long-term study of sea turtles in the British Indian Ocean Territory with the aim of learning more about the biology of the incredible animals and to determine how effective the MPA is at protecting them. We attached satellite tags to five of the nesting hawksbills. The satellite tag attachment takes around 2 hours: first the carapace is cleaned, sanded and then cleaned with acetone (nail varnish remover), then the satellite tag is embedded in epoxy paint and lastly painted with a coat of antifoul paint before being left to dry. The satellite tag process is the same as we have used for green turtles (see how we have attached satellite tags on green turtles; https://tinyurl.com/yccp7aur). We keep the turtle cool with shade and by pouring water on the carapace, head and shoulders. 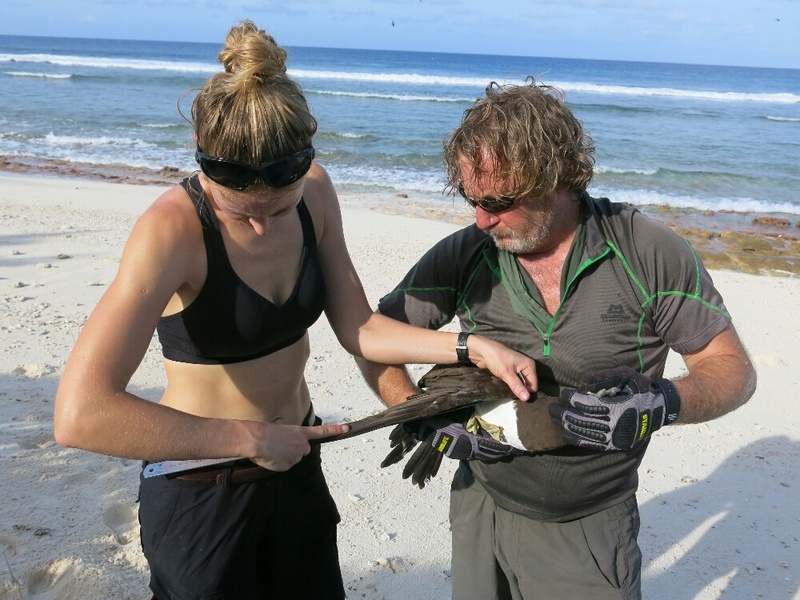 By the end of the expedition, we will have completed two weeks of nesting activity surveys to find out more about nesting emergence timings and the size of the nesting population in Diego Garcia. This will help inform timings for our expedition in November 2019 when we will continue our work with nesting hawksbill turtles. Satellite location uplinks are showing that all the satellite tagged hawksbills are still just offshore of the nesting beach, so we expect they will continue nesting every 12-14 days. In this way we will learn more about how many nests they lay in a breeding season before returning to their foraging grounds. We wait with baited breath to see the migration destinations of these hawksbill turtles. If you’re interested to receive updates, please join our ‘Chagos Turtles’ Facebook Group . It has long been known that the introduction of invasive species can have a detrimental effect on native flora and fauna. Rats decimate seabird populations all around the world by eating eggs and chicks – and sometimes even adult birds. The British Indian Ocean Territory includes the Chagos Archipelago and 58 tiny islands. Some of the islands are home to the Black rat (Rattus rattus), whereas others have mercifully remained rat free. 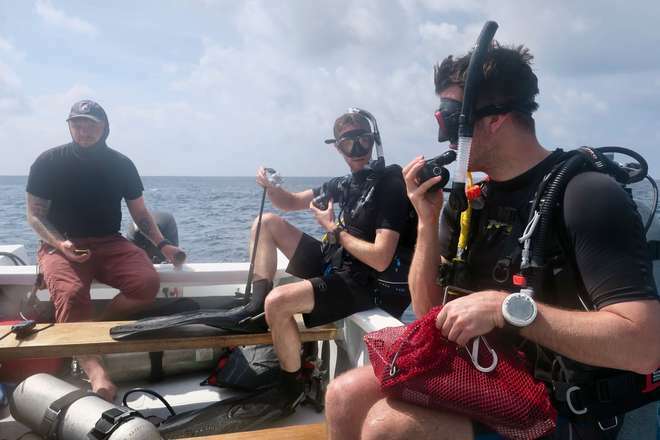 Researchers from the Bertarelli Programme in Marine Science have used these two types of islands – with rats and without – to see what effect the prescence of rats has on the health of the surrounding coral reefs. On rat-free islands, seabirds including boobies, frigatebirds, noddies, shearwaters and terns travel hundreds of kilometres to feed out in the ocean. When they return to the island, they deposit rich nutrients from the fish they feed on. 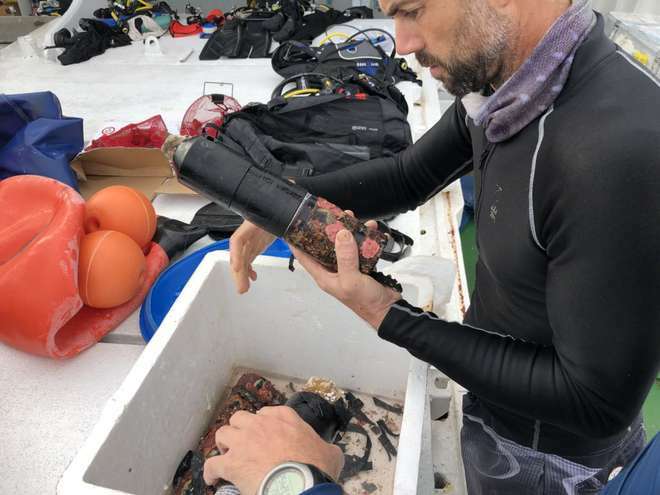 Prof. Nick Graham of Lancaster University considered whether these nutrients were being leached into surrounding waters and were influential in the biology of the reef systems. The findings, published today in Nature, are stark – fish on reefs adjacent to rat-free islands grew faster and larger compared to those fish living adjacent to rat-infested islands. As coral reefs are regularly affected by changes in ocean temperature and the frequencey of coral bleaching events increases, this research suggests that the removal of invasive species like rats, could become an important way of increasing the resilience of these essential habitats. 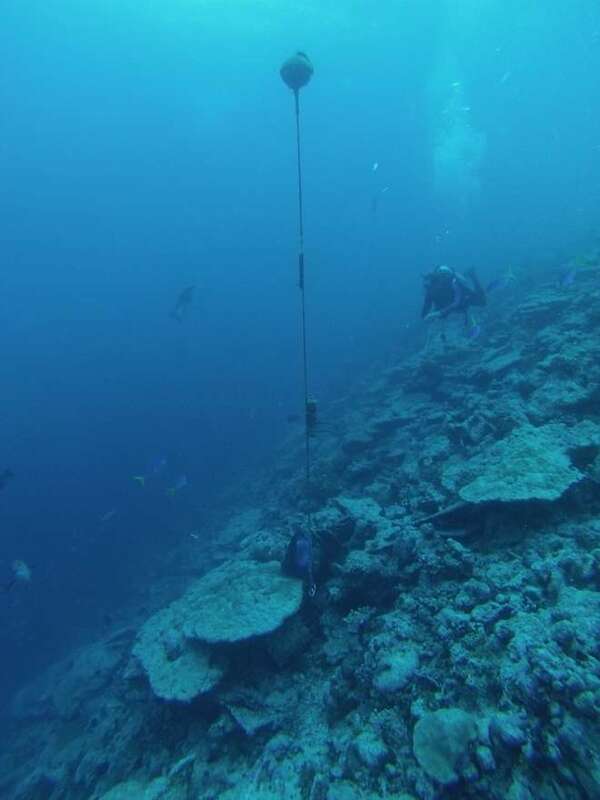 Prof. Chris Perry and myself from the University of Exeter are studying the carbonate budgets of coral reefs around the islands of the Chagos Archipelago. The “Reef Budget” method we use was developed by Chris and calculates how much carbonate is produced by corals and calcifying algae, and how much is eroded by grazing sea urchins and fish, as well as by internal bioeroders such as boring worms and microorganisms. The results provide a metric of reef “health” in terms of whether it is growing or eroding. The sites in Salomon and Peros Banhos we visited so far show a dramatically reduced coral cover due to the severe bleaching event in 2016, causing carbonate production rates to drop to about a third of the values in 2015. On the upside, there are many Porites and also some Acropora colonies that apparently survived the bleaching, and large numbers of small recruits of different genera. Especially in the understory of the reef structure, we find many live encrusting corals. Also, the substrate is quite clean of macroalgae, thanks to the high abundance of grazing herbivorous fish. Calcareous algae covering the dead coral substrate continue to produce substantial amounts of carbonate which help “glue” the existing structure together and offer a great substrate for further coral recruitment. We therefore hope we can see a fast recovery of the once glorious reefs over the next years. 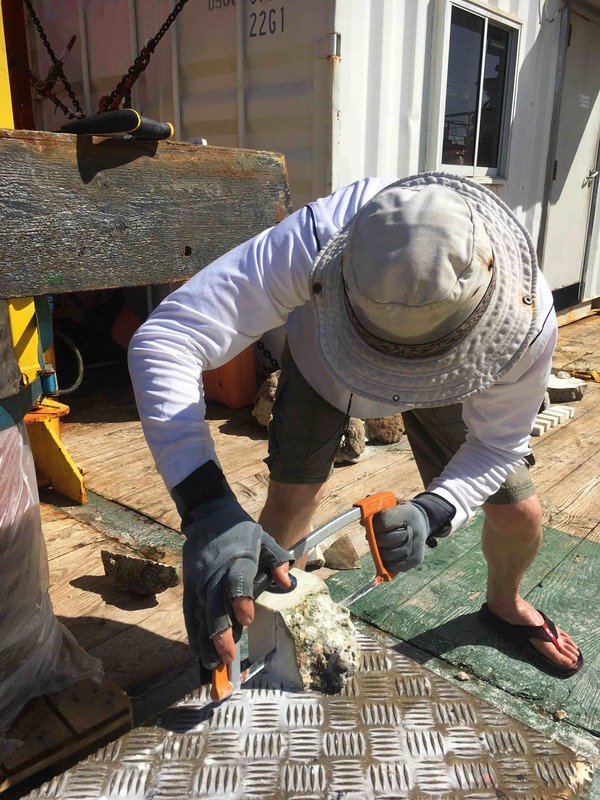 To investigate local bioerosion rates in the reefs we had a “fun” day sawing 1,000s of blocks from dead Porites skeleton (well, it certainly felt like that, on my last count it was actually 28). 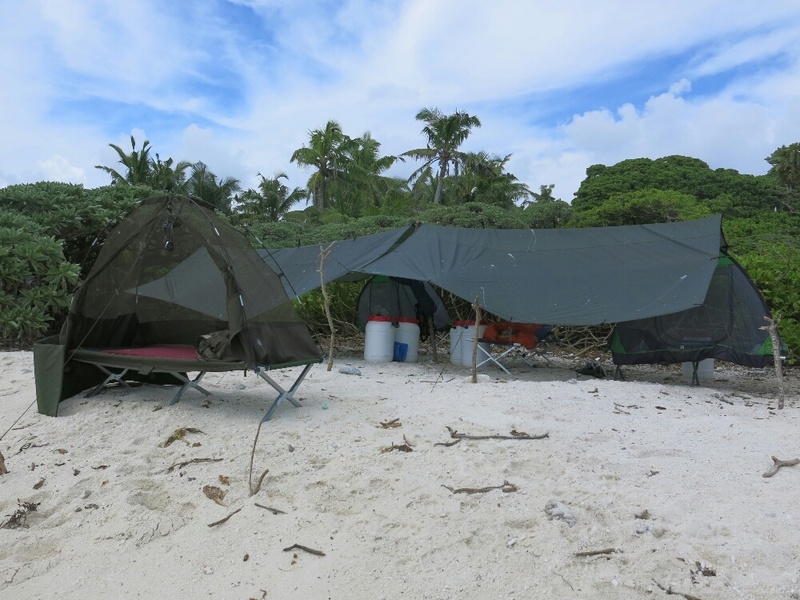 We are over half way through our expedition to the Chagos Archipelago in the British Indian Ocean Territory and have visited most of the major islands and atolls in the northern half of the reserve over the last week or so. 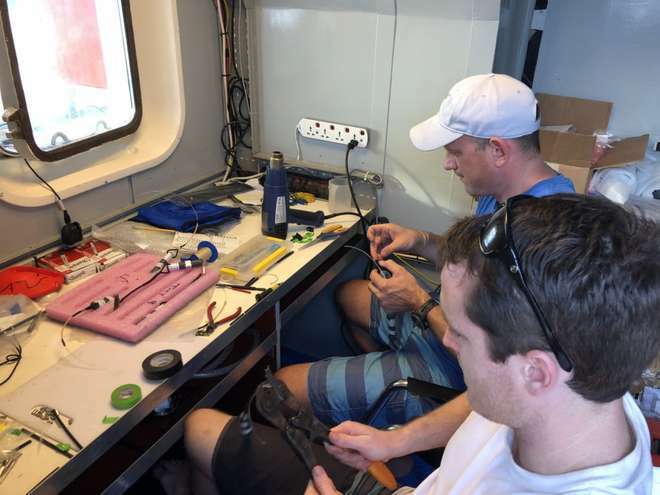 Thankfully the worst of the weather has now passed and we are well into the groove of servicing the 76 acoustic receivers we have out here. Yet, with every dive, it has become apparent that all is not quite as I remember previously. It may be the passage of time casting a rosy hue over my eyes, but on my previous visit to these reefs in 2014, I recall seeing a lot more sharks, and bigger ones too. Back then, upon jumping into the water and once the bubbles had cleared from the front of your mask, you were met by a least a few inquisitive silvertip sharks whose curiosity would drive them to check out any foreign body entering their reef home. I have yet to experience that this year. The welcoming party is simply nowhere to be seen. Sure, we are still seeing sharks on nearly every dive and it is the exception, rather than the rule, that a dive passes without a visit from at least one grey reef or white tip reef shark. However, in previous years it wasn’t uncommon to be circled by a posse of dozens. So, what has happened to the reefs residents in the intervening four years? Perhaps we have just been unlucky this time around. Perhaps the recent storm and resulting reduction in visibility has meant that the sharks have been there but that we couldn’t see them. While both might be contributing factors, I fear more sinister processes might be at play. Over the last few years, the reefs of the Chagos Archipelago, like many reefs across the world, have been hit by mass coral bleaching events. The severity of the bleaching has left reefs on their knees, littered with dead coral and broken rubble. I therefore wouldn’t blame a reef shark if it decided to pack up its bags and seek pastures new. Perhaps it’s those rose-tinted glasses again, but maybe the cooler water at depth, where the impacts of warming water are at least somewhat diminished, is acting as a refuge in times of trouble. Therefore, maybe the sharks are simply residing just beyond the beady eyes of SCUBA divers. Yet while coral cover is down, there are still a healthy number of reef fish going about their daily routines. Therefore, for species like silvertip sharks, the table is still set, and the dinner is ready to be served but few are home to enjoy the feast. Notable are large numbers of smaller predatory fish like groupers, snappers and the speedy trevallies patrolling the reef edge. Perhaps benefiting from the reduction in the reefs top predators. The main theory for the disappearance, and probably where the Occam’s razor principle points, is that these sharks are simply being lost to the threat of illegal fishing. 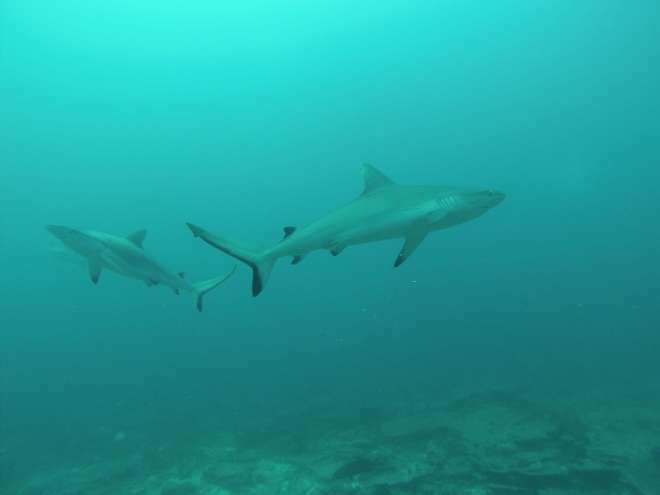 Records of vessels caught poaching within the reserve’s boundaries show that these fishers, predominantly from Sri Lanka and India, are indeed targeting sharks. It therefore may be that the endearing curiosity of the sharks has ultimately led to their downfall. Brazen and inquisitive enough to approach divers, bold and curious enough to bite down on a tantalizing piece of bait. Indeed, we know from the reserve’s patrol vessel that a large-scale illegal fishing event in late 2014 resulted in mass shark casualties. 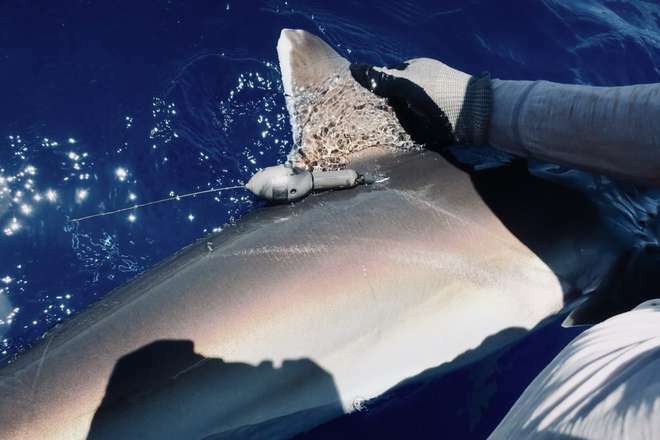 Glancing at the data we received from our sharks tagged at the time, a whole cohort of tagged sharks “went silent” within days of each other, never to be heard again. While we can’t conclusively say we lost our tagged sharks to illegal fishers, it certainly seems highly likely. As for the reefs themselves, the Chagos Archipelago has, in the past, expressed an incredible resilience to bleaching events and an ability to bounce back quickly. Indeed, while on every dive we see large crumbling plates of Acropora tables, we also see every one covered in tiny coral recruits, the future engineers of the reefs regeneration. It now just remains to be seen how big they can grow before the next coral bleaching event. Here’s hoping for a good few years respite. Blog Post: Being a rubber duck in the Indian Ocean! As I write this blog we are currently moored off of Nelson Island, a small isolated island in the middle of the Indian Ocean, being circled by hundreds of frigate birds, terns and boobie birds. It is one of over 60 such islands that make up the British Indian Ocean Territory. But why am I here? The British Indian Ocean Territory was declared a no-take marine reserve in 2010 and since 2012 we have been tagging sharks, mantas and tunas here to better understand how they are using the reserve’s waters and ascertain how effective the reserve is at protecting them. 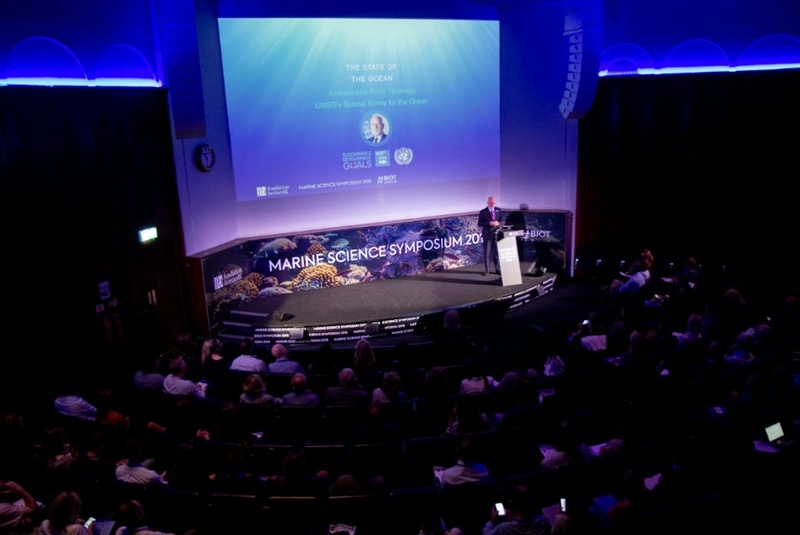 This year I am part of an international team of scientists, funded by the Bertarelli Foundation, onboard the Tethy’s Supporter, a vessel that came across from the Seychelles to support this expedition. We rendezvoused and boarded the vessel in the Maldives six days ago but unfortunately the weather has not been on our side thus far. Our two-day transit down from the Maldives was dogged by choppy seas resulting in our boat bobbing around the ocean like a child’s bath toy. Those transit days were spent checking dive gear and prepping shark tagging equipment, whilst the nights were spent trying to get some sleep although the ocean and the boat were working in perfect tandem to try and roll us out of our bunk beds. I was regretting my foolish and naive nabbing of a top bunk. It’s a long way down to the cabin floor…. After two pretty much sleepless nights, we were all relieved to arrive to the relative calm of Salomon Atoll. Once inside, we were sheltered from the big swell that had been raging from the west and were able to get some much-needed rest. 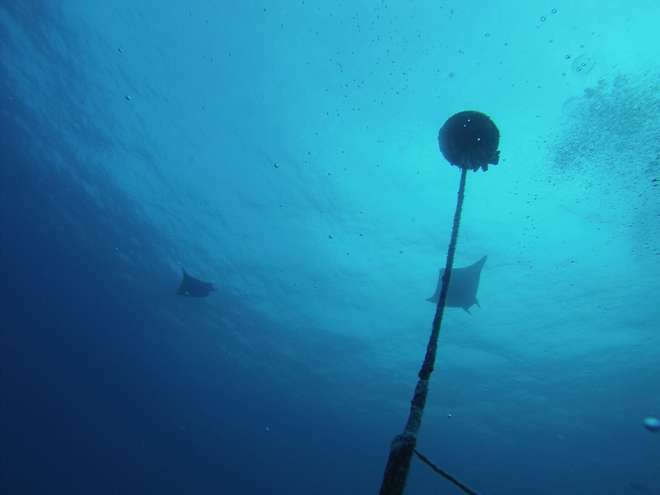 The following morning, we divided into two teams to set about our primary objective, to service the extensive acoustic receiver array network we have installed around the atolls out here. Each receiver logs the occurrence of any tagged shark that may swim within its detection range (~500m) and we have installed 76 such receivers across the archipelago over the last few years. 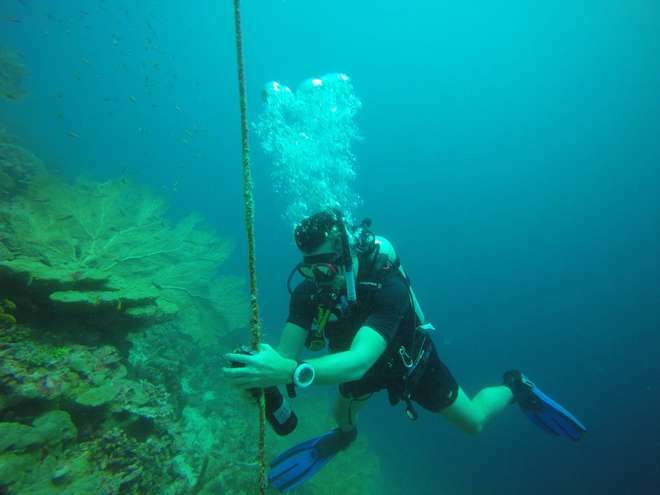 On this expedition we will be SCUBA diving on each one (~20-25m), replacing the old receiver with a fresh new one, and bringing the old receiver to the surface to download the data. That’s the exciting bit – finding out what it has recorded over the last few years. Our first morning however didn’t quite go to plan, with the persistent swell meaning we weren’t able to access some of our sites around Salomon safely in our dive boats. It was no trouble for the resident spinner and bottlenose dolphins however, who we could see effortlessly playing in the rough water around the atoll almost mocking us with the ease with which they managed the swell. Still, they were very cool to see. As the acoustic array can only detect animals that have been equipped with specific acoustic tags, we of course have to attach these devices to animals. However, the weather conditions have just made it too tricky to tag any sharks or manta rays just yet. So, for now we are focusing on servicing as many receivers as we can and will focus on tagging more once the weather improves. After servicing all of the receivers that we could around Salomon, the following morning we headed west to Peros Banhos atoll. This massive atoll (~25km across) is where the vast majority of our receivers are located. A few days servicing receivers there we headed east to Nelson Island where we are now anchored.